Rinse and drain black beans and discard any rocks or funky-looking (discolored, wrinkly) beans. In heavy soup pot, combine black beans, 6 cups of water, salt and bay leaf. Reduce heat and simmer, partially covered, until beans are tender, about 1½ hours. Keep an eye on the water, and add more if needed, 1 cup at a time. Beans should have some liquid remaining, but they should not be overly soupy. When beans are almost done, prepare the vegetables. In large saucepan, heat the olive oil and sauté the shallot, garlic, red pepper, and tomatillos until tender, 10-15 minutes. When beans are completely tender, remove the bay leaf, and add the sautéed vegetables and any remaining oil, the salt, pepper, spices, kidney beans, crushed tomatoes, and chocolate chips. Reduce heat and simmer, uncovered, until chili thickens and flavors meld, about 30 minutes. 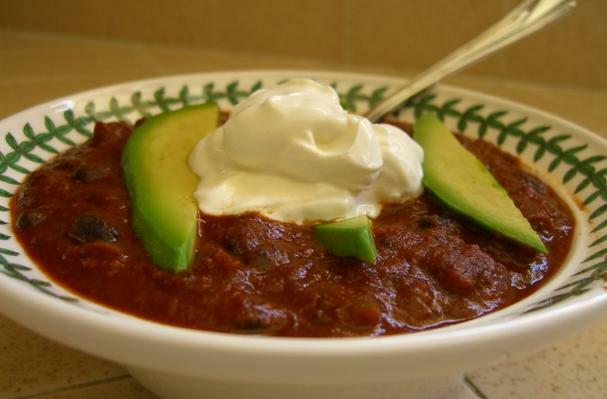 Remove pot from heat and let chili cool for about 20 minutes before pureeing two cups in blender. If you try to puree hot liquid in a blender, the people who move into your house after you will inherit the splatter, and they will curse you. Return pureed chili to pot and mix through. Heat through until warm, about 5 minutes. Ladle into bowls and heap on whichever garnishes speak to you. Years before Seinfeld immortalized the Soup Nazi, whose real name is Al Yeganeh, I spent many a lunch hour plunking down my money on Mr. Yeganeh’s counter as I placed my order and swiftly moved to the left to wait for the best soup in North America. Shrimp bisque, mulligatawny, cream of sweet potato and vegetable chili warmed me during several impossible New York winters. Hitting the Soup Kitchen International, the proper name of Mr. Yeganeh’s establishment, was usually the highlight of a day filled with deadlines, cranky writers and a Mac that was constantly crashing. Mr. Yeganeh was never mean to me. Along with my soup, he would always give me a crusty hunk of French bread (my favorite), a bunch of sweet green grapes and a medallion of milk chocolate wrapped in gold foil. He would also smile at me more often than not. I found Mr. Yeganeh pretty easy on the eyes. Tall, dark, handsome and wearing a kerchief about his neck, he could easily have created his off-putting persona simply to keep the ladies from flirting with him so he could concentrate on soup. It’s just a theory. One of my coworkers, Colleen, seemed to incite Mr. Yeganeh’s ire every time she visited the Soup Kitchen. She would often come back to the office without bread, fruit or chocolate and sometimes without even a spoon. This completely entertained me, and I looked forward to Colleen’s Soup Kitchen misadventures. Colleen is a freewheeling, loquacious chick, so I can see her trying to strike up a conversation with Mr. Yeganeh, not putting her money down as she orders and asking outright for bread and chocolate, all of which were forbidden. There was a flavor in Mr. Yeganeh’s chili that I could never put my finger on. It was sweet and warm, and after years of creating my own variations of that chili, I think I finally hit on what it was: chocolate. Now, I could be completely wrong here, but I have come close to duplicating the taste of his chili by adding chocolate to mine. I am very sad to report that Mr. Yeganeh’s Soup Kitchen is closed for good. But, his legacy lives on, and I intend to keep my finger on the creative soup pulse for as long as I draw breath. Maybe he can be convinced to open up shop somewhere on the Left Coast. I can dream, can’t I? This chili recipe is all about options. If you don’t like kidney beans, swap them out for pintos or add more black beans. The heat on this is pretty tame, so if you want more, chop up and seed a jalapeño or two and sauté with the rest of the veggies. Chili powders have varying degrees of heat, so know how hot your chili powder is and adjust the amount accordingly. Nothing’s worse than chili that’s too spicy to enjoy. I have flown in the face of bean-cooking convention here by not soaking the beans beforehand and salting them while cooking. Follow my example. Live dangerously. 1. Rinse and drain black beans and discard any rocks or funky-looking (discolored, wrinkly) beans. 2. In heavy soup pot, combine black beans, 6 cups of water, salt and bay leaf. Bring to a boil. Reduce heat and simmer, partially covered, until beans are tender, about 1½ hours. Keep an eye on the water, and add more if needed, 1 cup at a time. Beans should have some liquid remaining, but they should not be overly soupy. 3. When beans are almost done, prepare the vegetables. In large saucepan, heat the olive oil and sauté the shallot, garlic, red pepper, and tomatillos until tender, 10-15 minutes. 4. When beans are completely tender, remove the bay leaf, and add the sautéed vegetables and any remaining oil, the salt, pepper, spices, kidney beans, crushed tomatoes, and chocolate chips. Bring chili to a boil. Reduce heat and simmer, uncovered, until chili thickens and flavors meld, about 30 minutes. Stir occasionally. Remove pot from heat and let chili cool for about 20 minutes before pureeing two cups in blender. If you try to puree hot liquid in a blender, the people who move into your house after you will inherit the splatter, and they will curse you. Return pureed chili to pot and mix through. Taste, and add salt and pepper if needed. Heat through until warm, about 5 minutes. 5. Ladle into bowls and heap on whichever garnishes speak to you.